Candace Calvert is an ER nurse who landed on the "other side of the stethoscope" after the equestrian accident that broke her neck and convinced her that love, laughter—and faith—are the very best medicines of all. The inspirational account of her accident and recovery appears in Chicken Soup for the Nurse's Soul and launched her writing career. The author of a madcap cruise mystery series in the secular market, Candace now eagerly follows her heart to write Christian fiction for Tyndale House. Her new medical drama series offers readers a chance to "scrub in" on the exciting world of emergency medicine, along with charismatic characters, pulse-pounding action, tender romance, humor, suspense—and a soul-soothing prescription for hope. Please visit her Web site at www.candacecalvert.com. Excellent! In this very suspenseful, christian romance, Candace Calvert takes you head on into the action of the ER. Through the first half of the book I had decided to give this book 4 stars, but during the second half something happened! It became un-put-down-able with its gripping excitement and had me in tears at the end! I ended up giving this book 5 stars. I love ER and medical drama ("ER" was my all time favorite TV show and Robin Cook is one of my favorite Authors). Reading this book made me feel like I was watching a season of ER again. It was so exciting! I am not one to pick up a romance book, but this did not read like a romance, it read like a real good christian suspense book. This has real good christian values and had a good (not too strong) christian message. There was excellent character development. I loved Leigh and Nick right away. And I hated Sam, "the other woman" (also right away). This was enough to make me a fan of Calvert's. I have already looked into her other books. If you like Medical drama, Suspense, Christian fiction, or Romance - then this book is for you! I am giving away my copy of this book to one lucky commenter. What medical drama book have you enjoyed? or What medical drama TV show do you watch (or have watched)? I will pick a winner using random.org on Oct. 21st. Please only USA and Canada. Thank you Tyndale House Publishers for providing me with a complimentary copy of this book to review. My Fav. medical tv show to watch is HOUSE. I love his personality and the way he always solves it. My fav is House...it has drama, funny and love all at the same time. 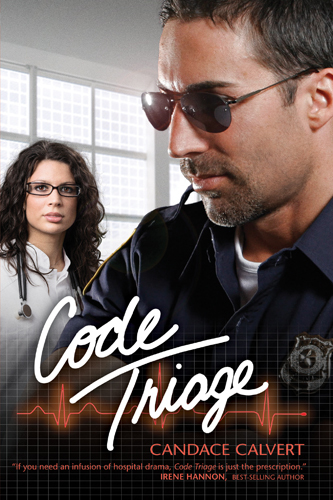 I so appreciate this enthusiastic review of Code Triage--thank you! PS I love Robin Cook, too. And medical TV way back to Ben Casey, Chicago Hope, Marcus Welby . . . I was once an avid ER watcher. And more recently a Grey's Anatomy rerun watcher, via dvd's from my local library. Medical drama's are intriguing because they mix danger with real life. ER is my all time favorite medical drama. Even though I've seen pretty much all of the episodes they rerun, I still LOVE it! Growing up, I loved watching Dr.Kildare and now I've watched some House and Grey's Anatomy. This book sounds really good. I have not read a lot of medical fiction. Does Jodi Picoult's books count? She often writes about medical conditions. As far as TV shows, ER. I used to watch Dr. Kildare and Ben Casey, then ER and now I love House. I like shows that focus more on the patient and the illness. I used to read Robin Cook's books but then I could easily guess the ending so I lost interest. I am very interested in books that not not really science fiction but truly a medical story. My favorite medical drama would be House. I'm not sure why, but once I started watching it I just can't seem to stop. I think mine would be House as well! He is sort of mean, though. lol! Trapper John, M.D! Those old shows never get too old for me! remember marcus welby, md...and medical center??? My favorite medical show to watch would definitely be House. I love how there's always a problem that needs to be solved! My favorite is House, too! My favorite medical drama was ER. I've spent a lot of time in the hospital over the years. Candace's book "Critical Care" was the first Christian book I'd ever read. I thought it was very believable and carried a wonderful message of hope. My email is revlanc (at) gmail (dot)com. I love watching Grey's Anatomy! I'd love to read this book. My first medical book was Coma by Robin Cook. Very scary! I love HOUSE. It's a really great medical drama. I watch Grey's Anatomy. =) I didn't even know that medical drama books even existed until now.